The fastest ice in the world for Olympians and the community. 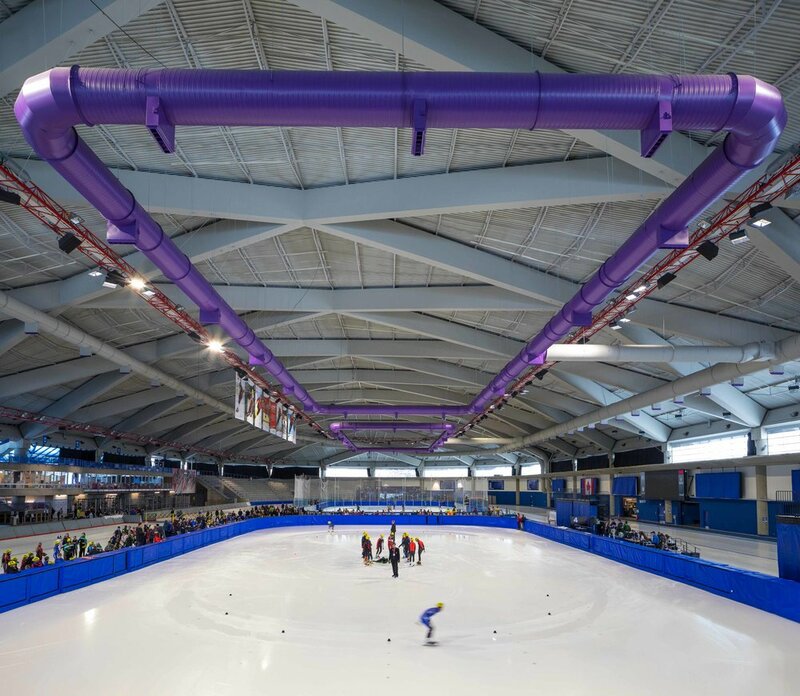 The Olympic Oval was the speed skating venue was designed for the XV Winter Olympic Games in Calgary and is still used today by varsity athletes and the community. As it was the world’s first indoor speed skating facility, it was very important to the speed skaters that they have access to natural light and views to the sky. Based on extensive daylighting studies conducted at the University of California at Berkeley, a daylighting system was developed that incorporates light shelves along the building's perimeter enabling natural light to be reflected through the ceiling and deep into the interior. The vast clear span of the roof was achieved by a superstructure of intersecting precast concrete arches and is clad with porcelain enamel panels. With the uninterrupted floor space, the oval could contain the speed skating track as well as running track and spectator seating without compromising viewing. The Oval is 203 metres long by 89 metres wide and accommodates up to 4100 spectators. In addition to its 400-metre speed skating track, the Oval contains two Olympic-sized ice rinks, 2 jogging tracks of over 400 metres, and six 50-metre sprint lanes. As part of the University of Calgary's Kinesiology Complex, the Olympic Oval meets the needs of the University, community, and general public for recreational sports as well as the specialized requirements of high performance athletes for training and competition. The Oval functions as an arena for hockey, figure skating, and speed skating in the winter and as a field-house for dryland training in the summer.